And just like that, we're almost done. After a brief foray in search of some concrete blocks (more on that in another post, after I've made some phone calls), Noel got back to finishing up the last bits of wood on the deck. He installed the wood over the right side of the lower stairs. After doing the other side, he didn't have to take as much time with this side. 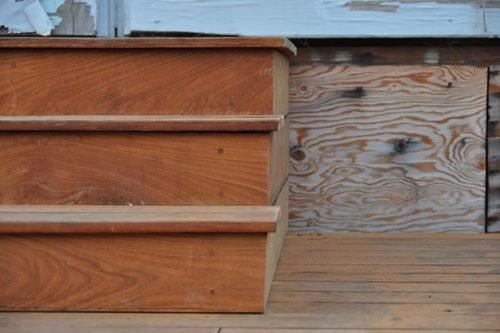 Then he trimmed the step ends on the right sides of both stairs. Then he sanded a whole mess of cut off plug ends until he was about done with being vibrated by a piece of machinery. 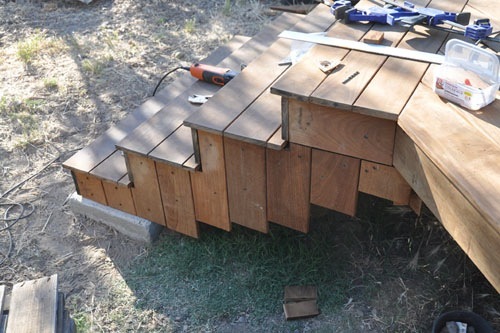 That was the last of the wood to be installed on the deck apart from somehow sticking the tank hatch opening pieces together. 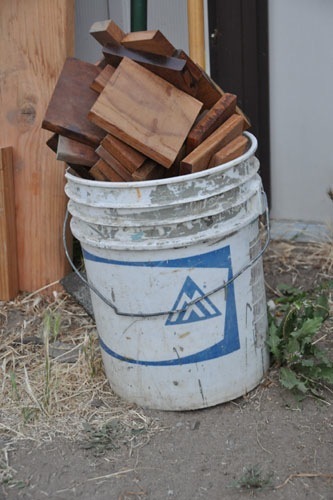 Our leftovers were this one 5-gallon bucket full of little chunks of wood. Not bad for an amount of waste from a project this big, and some of it of a size worth saving for little projects or odds and ends. Unusably small scraps can get turned into ash for the compost. Still to be done: plugs on the side of the lower stairs need to be installed and trimmed flush. Everything needs a nice vigourous sanding. The hatch needs to be figured out. Then we seal. It looks FANTASTIC! Are you required by code to add any railings or can you keep it open like this? I'm never sure which design I prefer but I think the open deck looks bigger overall. 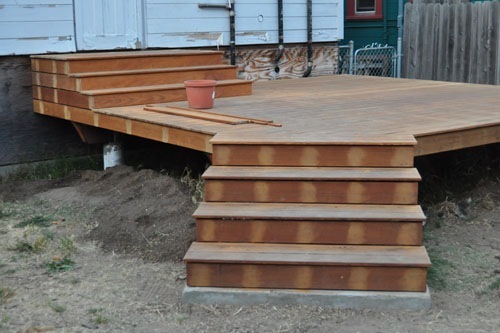 We do have to add railings, though code only requires them at the stairs. On the other hand, the deck is high enough up that falling off would hurt, and a railing means we can actually use every inch of the space (you can't put a table up against an open edge without risking backing a chair over it). We're going to use a prefabricated metal railing that we haven't gotten from the lumberyard yet.